A swanky monogram for the modern sophisticate. 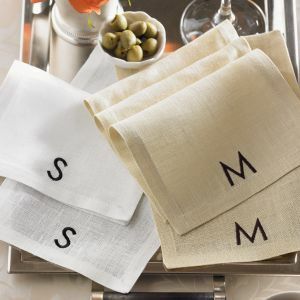 Block letters are showcased on SFERRA's best-selling Festival linen for these chic cocktail napkins. White linen has black embroidery; Stone linen is embellished in brown embroidery. A classic shape revisited with these 6x9" cocktail napkin. Fold it in half for that perfect party companion. A wonderful hostess gift, packaged in sets of four in an organdy bag with button closure. This product is discontinued and availability is limited to options listed. Machine wash using a gentle detergent. Never use chlorine-based bleach. Line dry or tumble dry on low heat; remove while still damp. Iron while damp on reverse side of fabric.